Mitsubishi Materials is proud to announce the expansion of our WSX445 Double Sided Insert Type Face Mill Line. 1.5” double sided insert type face mill. 63mm and 80mm shank type holder. Coolant though set bolt for 1.5” and 40mm arbor type face mills. H-breaker insert expansion to include MP6120 and MP6130 grades. Two new insert grades; MC5020 with M, R & H breaker and TF15 grade with L breaker. 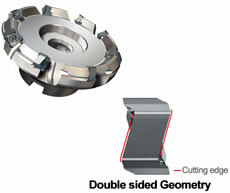 New double sided insert type face milling cutter with innovative cutting edge. Features unique proprietary “Double sided and Z Geometry” insert. Unique conical insert pocket seating. Stainless Steel, High Temperature Alloys, Titanium Alloys, Steel, Cast Iron and Non-Ferrous Metal. Provides low cutting resistance by utilizing features of conventional positive and negative rake inserts. Results in a perfect balance between convenience and high efficiency. Shims are not needed due to the high rigidity of the very thick insert. Through coolant holes improves chip discharge and prevents chip welding.